The referring account must be active with a minimum of a $50 balance.WAGERING REQUIREMENTS Intertops In order to receive these bonuses, you must play at least 3 times the amount of your deposit and your bonus. For example, if you deposit $200 and get a $50 bonus, you must play $750 in order to receive your bonus.You may withdraw the amount of your deposit at any time and forfeit your bonus.RULES1. 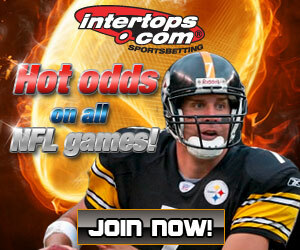 In order to receive ANY bonuses Intertops , this form must be submitted to us within 24 hours of your deposit.2. All bonuses are limited to one per household.3. New player bonuses are valid only for initial deposits.4. All bonuses will be void if not played within 30 days.5. All bonuses may be voided at any time under management discretion, and management has the right to refuse any bonus to any customer.6. All protmotional parlays valid for 1 week from date of deposit.